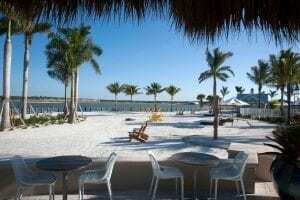 Naples Reserve’s lakefront clubhouse and its outdoor amenities are now open. Award-winning developer iStar announced the completion of the Island Club, designed as the heart of the 688-acre lakefront community with indoor and alfresco gathering areas, including the fireside grand hall and Latitudes Cafe, wraparound porches, an open-air tiki hut, and sunny and shaded spots around the resort-style pool and on the beach. Construction of the club’s beach volleyball and bocce ball courts is also complete. The Island Club features two buildings: the main clubhouse and an adjacent fitness center. Its architecture conveys a Key West ambience with aqua blue-painted shake and HardiePlank lap siding, white trim and louvered shutters, dormers and metal roofs. 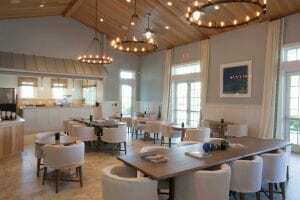 The Southern Coastal motif continues inside the 5,160-square-foot clubhouse, combining elements of contemporary, natural and vintage Florida design. The building features a freestanding stone fireplace between the grand hall and cafe, tile flooring, tongue-and-groove vaulted ceilings and a palette of blue and tan with gray accents and chocolate and charcoal undertones. Brighter colors are introduced in artwork throughout the space. Furniture and accessories feature black iron and distressed finishes, capturing Naples Reserve’s sense of barefoot elegance. Latitudes Cafe offers large family-style tables and a community chalkboard wall for messaging. The Island Club is also the new home of Naples Reserve’s experiential Welcome Center, featuring an 850-gallon cylindrical aquarium and presentations about the community’s lifestyle, homes, builders and neighborhoods nestled along lakes, nature preserves and a linear park. Bifolding and double French doors open to the porches and verandah with chairs and tables poised to the Island Club’s expansive alfresco area. Featuring a pool with a rock waterfall and junior Olympic-size lap lanes, a splash pool for children and sunny chaise lounges, the outdoor area also offers an event lawn, fire pits, a large beach and a party pavilion where the Chat ‘n Chill Tiki Bar serves umbrella drinks. 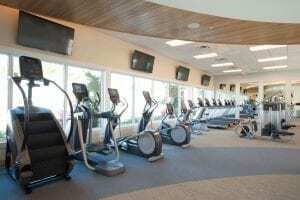 Similar views are displayed from the adjoining 3,500-square-foot fitness center, which offers state-of-the-art equipment, a weight room and group fitness studio. The community’s Outrigger Center, evocative of Key West with its palette of turquoise, beige and white, features a wraparound porch overlooking the lake and floating docks. The center provides paddleboards, kayaks and canoes for residents to explore the 125-acre Eagle Lake and the destination Kontiki Island, complete with an oversized tiki hut. Naples Reserve’s two Duffy boats, Tranquility and Little Skipper, offer lake and island tours. Construction continues on Match Point, the lakefront tennis and pickleball court complex. The facility is scheduled to open in January 2017. Additional planned amenities include a tot lot, two dog parks and a meandering biking, hiking and jogging linear park navigating a loop road circling Naples Reserve. Designed to engage residents with their natural environment, it also will provide an alternative mode of transportation throughout the community. iStar recently introduced new preferred builders and additional neighborhoods, several offering the opportunity to build personal floating docks along Eagle Lake to enjoy paddleboards, kayaks, canoes and even their own electric boats, as well boats with motors up to 2.5-horsepower. Eagle Lake is also accessible to residents by the community’s boat ramp. Naples Reserve offers attached villas by D.R. Horton; single-family homes built by Ashton Woods, D.R. Horton and Stock Signature Homes; and custom homes created by Florida Lifestyle Homes, KTS Homes, Lundstrom Development, Marvin Development, McGarvey Custom Homes and Stock Signature Homes. Created amongst 22 lakes and sweeping open water views, the community emphasizes lakefront living with Southern Coastal-inspired homes and amenities along the water’s edge. Lakes provide prime opportunities for paddling enthusiasts and scenic vistas. Eagle Lake features a mile-long stretch of lakefront nestled against the Picayune Strand State Forest, a 76,000-acre state park with protected pinelands, cypress swamps, marshes and abundant wildlife. Additional completed amenities include the community’s gatehouse and an elevated cobblestone entry bridge. Visitors experience Naples Reserve’s island hospitality the moment they arrive, with a token from the gatehouse that is redeemable for a signature YKnot drink at Latitudes Cafe.